I’m so excited to share my Hypnobabies home birth story! This is my second birth, but first Hypnobabies birth. 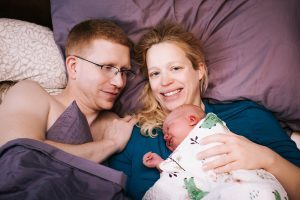 After having my first birth go completely differently than I had planned and hoped, ultimately ending in a cesarean while I was under general anesthesia, I knew I need to make changes with this pregnancy and birth plan to help ensure my goal of an unmedicated vaginal birth. I chose to have home birth with a Certified Nurse Midwife. I also made self-care a priority during pregnancy. I saw a physical therapist to help with pregnancy-induced carpal tunnel I developed, started chiropractic care at 16 weeks, had regular therapy appointments, meditated daily, exercised most day so of the week (water aerobics, prenatal yoga, and walking), got a couple of pregnancy massages in my last trimester and chose to take part in Hypnobabies hypnosis practice. Hypnobabies really helped me stay calm and relaxed throughout my last trimester of pregnancy. I looked forward to my Hypnobabies practice every day. The night before my guess date I had prodromal birthing time (Hypnobabies word for labor) with birthing waves (Hypnobabies word for contractions) coming every 7 – 18 minutes throughout the night. They fizzled out the next morning, but by 4 pm in the afternoon the waves had started again. I’d only gotten 3 hours of sleep over the past 30 hours, so I knew I needed to rest as much as possible. My husband and I laid in bed listening to my Hypnobabies hypnosis tracks as my birthing time began. By about 8:30 pm I no longer wanted to stay in bed as my waves were starting to pick up. At about 10 pm my doula and birth photographer joined us at home. I moved to the living room and tried many different positions. After about 45 min of birthing waves I went to the bathroom with my husband and told him I felt like my waves had slowed down since the birth team members arrived. My doula chimed in and said that actually my waves were coming every 4 minutes. She suggested going back to my bedroom where it was dark, and I might be more comfortable. Back in the bedroom things really started to pick up and soon my midwife team was on their way to join me. 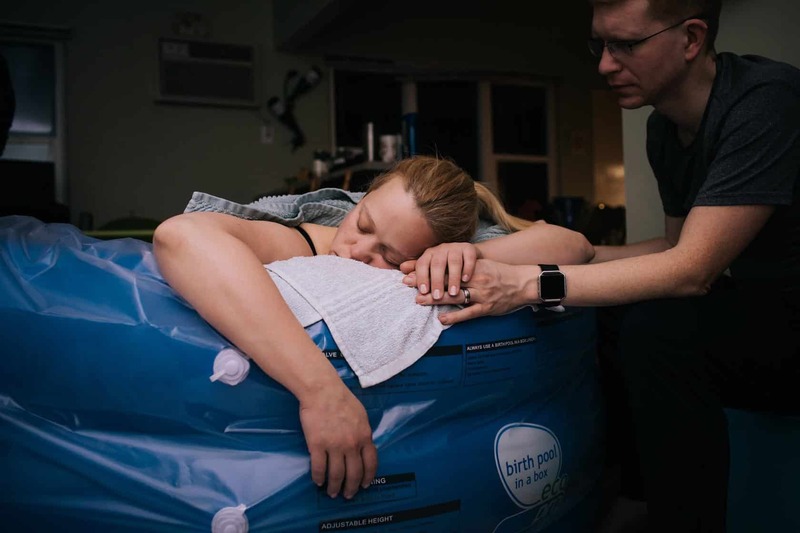 When they arrived around midnight, they started setting up the birth tub in my living room. Once the birth tub was set up, I got in and it felt so good to be in the warm water. I tried many different positions in the tub (draping over the edge while on my knees, reclining back with legs stretched out, lying on my side with one leg up over the edge of the birth tub). All the while my Hypnobabies hypnosis tracks were playing aloud for all to hear. 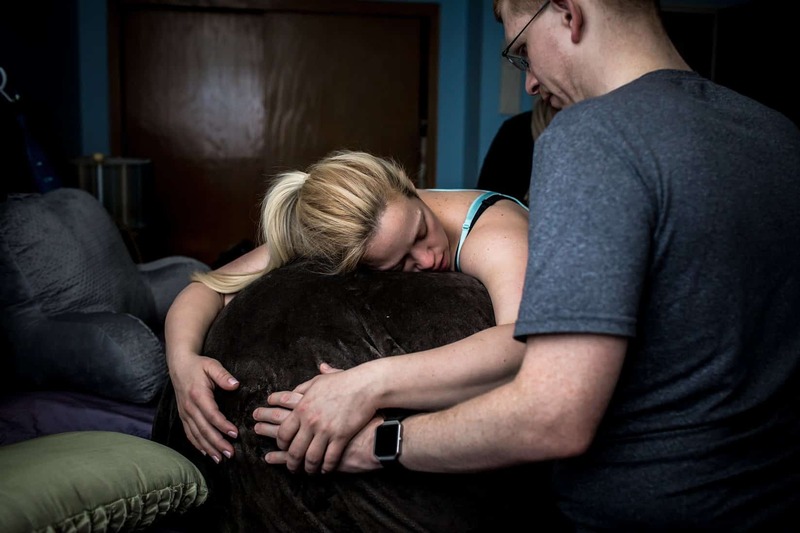 My doula and husband were putting counter pressure on my back, doing hip squeezes, holding my hands and alternating giving me cues to Release and Relax (Hypnobabies cues for entering hypnosis and deepening hypnosis). My bags of waters broke while I was in the tub and I knew that I was getting closer to meeting my baby. After an hour and half in the tub I moved back to the bedroom and started pushing on the bed while listening to the Pushing Baby Out track (Hypnobabies hypnosis track just for comfortable pushing). I pushed on my both sides and on my hands and knees. With each push I could feel and imagine my baby moving down my birth canal. I kept directing my bright orange hypno-anesthesia down in front of my baby’s head as I would breathe out during waves and think the word “Peace”(Hypnobabies word for instant physical comfort) and it worked! I could feel my perineum stretch with each push and then relax as baby’s head moved back up. With each push baby came down farther and farther. I really rested between each wave lying my head down on a pillow. Finally, after 43 minutes of pushing, I birthed my baby at 4:42am while on hands and knees! I turned over to my side to meet my baby. It was amazing! My baby turned out to be a girl. Despite me being a first-time pusher and my daughter being born with her fist by her head I only had a couple very superficial tears. Nothing needed to be repaired! I truly believe the tools I learned from Hypnobabies helped with that. My daughter weighed 8lb 11oz and was 21” long at birth. My entire birthing time was about 12 hours long and I was in my active birthing time for just under 6 hours. This Hypnobabies home birth was the most empowering thing I’ve ever done. I felt so supported and like I had several people cheering me on. I knew I could do it and so did they. Three weeks later and I’m definitely still riding this birth high. It’ll be something I never ever forget. I’m so elated that I got the redemptive birth I longed for. I got my HBAC! I joined a long lineage of women before me who birthed their babies naturally and there’s something really powerful in that. My body did exactly what it was made to do. It grew and birthed this baby. My body is so powerful and miraculous!